Israeli couscous (called 'Ptitim' in Israel) is similar to regular couscous in that it's a small, whole grain-like food made from semolina or wheat flour. But unlike the regular couscous it is twice as big and toasted, rather than dried. Toasting gives it a slight nutty taste. It has a sturdy composition and cooks with a slight bite to it. Use it in soups or salads or as a side dish cooked like rice pilaf. 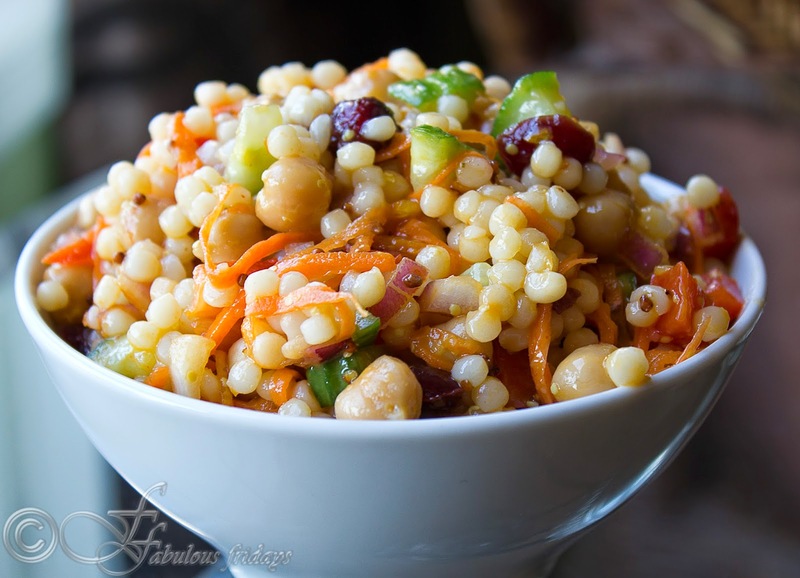 It is also called 'pearl couscous' or 'Jerusalem couscous'. Bring 1 1/2 cups of water with 1/4 tsp salt to boil. Add couscous, let boil again, cover and simmer for 8-10 minutes till cooked through and all liquid is absorbed. While couscous is boiling prep the veggies. Chop the cucumber, onion and red pepper. Grate the carrots. Mix all the veggies, chickpeas and cooked couscous in a large bowl. Whisk together all the ingredients for the dressing. Taste to adjust the sweetness, saltiness and tartness. Add the dressing to the salad. Toss gently to incorporate the dressing evenly. Keep for a minimum of two hours before serving to let the flavors blend. Thank you Khushi S. The varied textures and flavors in the dish make for an interesting blend. A great dish also to serve as a side dish with grilled paneer or any other BBQ dish.